This time of year, an insect pest called a leaf roller is causing brown spots on leaves. I have observed birds feeding on these so I started paying attention. Then, on a dog wood tree, while looking for brown leaves I found what appeared to be a brown leaf. I looked closely and it was not a leaf at all. It was a red bat. 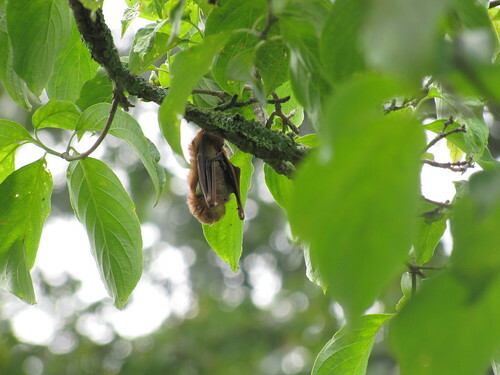 Red bats roost in trees and are one of our most common bats. If you are lucky to find one do not disturb it but enjoy it from a far. Well its getting close to kick off time at the park where Mike Tony and I work. the upcoming weekend promises to be quite a buzz with all of our scheduled programs for scouts and the general public – our most prized of all clients. This weekend 4/28/2012 will be nonstop for us all Herp related. To make sure we are better prepared it customary for members of our staff to legally obtain some native species from to serve as props for the programs. All animals are also customarily released back into their natural habitats unharmed soon after. The morning started out cold and rainy but Mike suggested we go out and search anyway before he was scheduled to work. So wihout too much twist of the arm I agreed and we headed out to some familiar sights that usually produce a few small snakes and possibly some decent phibs. We moved along flipping previously laid cover boards, the artifical hides made from plywood, finding mostly very dry substrate and ants and a few other insects. On the second to last board Mike yells out “Mark!! Come check this out!! !” I initially thought what possibly could he be so excited about. So I made my way over to Mike and there he was starring intently over the raised cover board and at the dry earth below. There lying side by side were two worm snakes one of which was definitely unusual. Neither one of us had seen anything like it so we could only specualte what it could be. 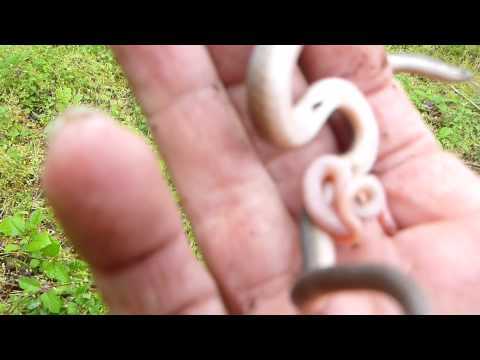 The one snake was definitely smaller and pink above and very pink below as opposed to the larger worm snake that had the normal brown dorsum with pink ventral side. 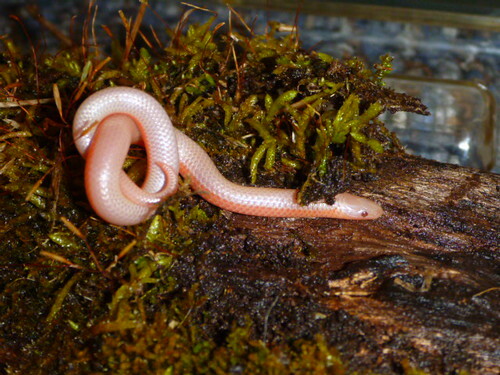 Coloration: On 22 April, 2012 at 11:43AM an albino Eastern Wormsnake (Carphophis a. amoenus) was discovered in mixed cedar and hardwoods section along the Walney tract of area of Ellanor C. Lawrence Park. 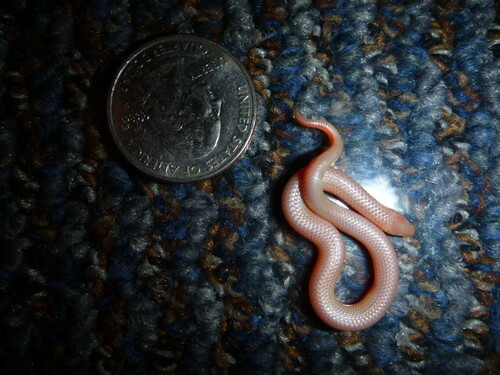 The specimen was found alongside a wild type worm snake under the same coverboard. Classic albinism was exhibited including red/pink eyes and a lack of any pigmentation except for a light yellowish coloration around the edges of the dorsal scales. Albinism in Carphophis amoenus amoenus has been previously reported in Arlington County, VA (Allard, H. A. 1945. 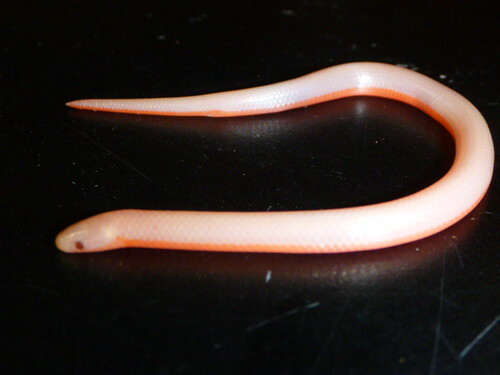 A color variant of the eastern worm snake. Copeia 1945:42) and in James City County, VA (Somma, Matthew. 2012. Field Notes – Coloration, Catesbeiana Volume 32 Number 1). Photographs were deposited with the VHS Digital Archive (#213) as a voucher. The animal was released after photos were taken. While on routine patrol of E.C. Lawrence Park, Tony Bulmer and Eric Malmgren stumbled upon this cool snake crossing Walney Road. 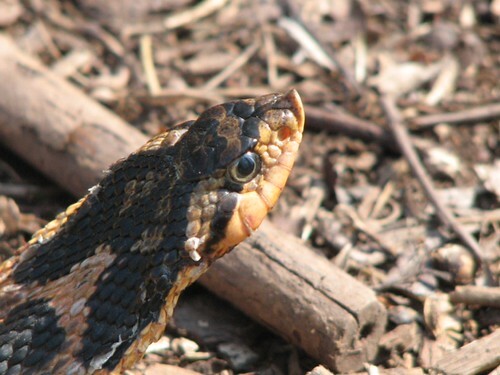 Eastern Hognose snakes are not a common site at the park. In fact this species is the second ever recorded siting in the park’s history. Today we conducted for the second year in a row our family homemeade birdfeeder program at the Walney Visitor Center at E.C. Lawrence Park. Weather was pretty cold somewhere in the the teens (at least it felt that way) but that didnt stop the hungary birds from nor the kids and their families from testing their newly made feeders. As you can see in the photos we used a variety of easily obtained materials found anywhwere in the home or yard. 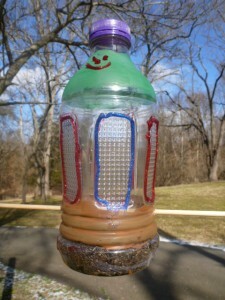 Homemade Birdfeeders is a great way to instill in youngsters a love for nature and the environment. Its great for both residential and migratory birds anytime of the year. With a little ingenuity and practice their is no limit as to what creative designs one can create. Where else can you take a ordinary piece of what would be trash or yard waste and make a wonderful craft that allows you to enjoy the fruits of your labor. 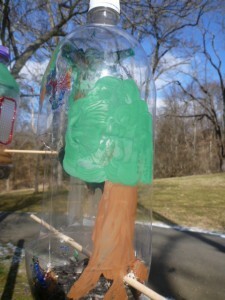 ITs great to see the expression on kids faces when birds arrive at their newly created feeders. Cant put a price on that experience!! Today Tony led our group on a reptile survey in the hopes of finding Queen and King Snakes. Queen snakes are somewhat rare in the park and we have seen them a few times over the past three years.Prior to three years ago there may have only been one recorded sighting since the park opened in the early 1970’s. Queen snakes are specialist in that they prefer one type of food-softshelled crayfish. As such this specialty makes them susceptible to localized extinction should the stream quality deteriorate due to pollution that may cause decline in the crayfish population. So we were pleased to see that the snakes are currently thriving in the area and that may in turn suggest stream quality is also good. The other speceis we enocountered today was a northern water snake. This one is so common near any body of water even a drainage ditch will harbor a few. Today was unique in that we found both species stretched out along tree limbs attempting to capture some ealry morning sun. Its not unusual for these snakes to climb out onto limbs especially above water. The branch serves as a place to bask while camoflouging the snakes from predtors. When threatened they can easily drop down into water and evade their potential predators. When we stumbled upon these snakes none of us were prepared in terms of camera accessories. A few had cell phones though and were able to get pics. Once the tour had ended I hung around the visitor center for a while then returned home to get my cameras. I decided to go back to Walney and visit the places where we saw the snakes basking. Remarkably they were in the same location and I was lucky enough to get some pics. Normally I am not this lucky and have to “chalk” it off as a missed opportunity. ALWAYS CARRY A CAMERA! !